Mr Robin Browning is Specialist Teaching Staff - Conducting in Music at the University of Southampton. I’ve enjoyed working alongside young conductors at the University of Southampton for over ten years, and have seen tremendous change in the scope and depth of the courses I teach and the students I’m lucky enough to coach during that time. My work has expanded greatly from what was a small class of third years a decade ago. It now encompasses an initial second-year conducting unit through to provision for one-to-one study for third years (including the presentation of a final performance recital as a conductor, in – broadly speaking – any genre), and now conducting study at postgraduate level too. I’ve been fortunate enough to have enjoyed a strong and profound technical training as a conductor. At the start of my career I sought out the world’s greatest conducting pedagogues, studying with Ilya Musin (the great teacher of Gergiev, Temirkanov and Bychkov), Joseph Gifford (an American movement specialist) and Sian Edwards (who now runs the conducting course at London’s Royal Academy of Music – herself one of Musin’s greatest students, who I’m lucky enough to regard as a close colleague). Such gifted teachers, and plenty of hard work, have given me a real understanding of the technical problems confronting today’s young conductors, and I’ve devised plenty of methods to help students overcome them. Alongside the technique of conducting, I also spent a great deal of time assisting and learning from some of the world’s most famous maestri: luminaries such as Sir Colin Davis, Haitink, Jansons, Esa-Pekka Salonen, to name just a few. I’ve developed an obsessive attention to score-detail, harmonic analysis and tonal colour, and consider myself well-equipped to pass this knowledge on to others. The conductors of tomorrow need many things, no matter whether they intend on working with school ensembles once they graduate or harbour ambitions to conduct at the highest level. Conducting study at the University of Southampton nurtures young talent with plenty of experience, training and background. Both the Music department and the thriving student musical scene as a whole offer plenty of gifted singers and instrumentalists with whom undergrad and postgrad conductors can work. Many Southampton alumni are conducting in the profession now. If you’re serious about becoming a musical leader of tomorrow, come and join them! Described as ‘An expert musician & conductor’ by Sir Charles Mackerras, Robin Browning is increasingly in demand with orchestras both in the UK and abroad. Following his debut with the Royal Philharmonic Orchestra at the Barbican Centre in London, which was broadcast on Classic FM, Robin has since conducted the Hallé Orchestra, English Northern Philharmonia, Northern Sinfonia, Danish Radio Symphony Orchestra, Ensemble Intercontemporain, St Petersburg Festival Orchestra and Estonian National Youth Orchestra, amongst many others. 2011 marked Robin’s US debut, conducting three subscription concerts with the Boise Philharmonic, and in 2013 he made his debut with Milton Keynes City Orchestra. In 2014 Robin assisted Sakari Oramo for the UK Premiere of Esa-Pekka Salonen’s Violin Concerto, working closely with Mr Oramo and the BBC Symphony Orchestra at the Barbican. He has also been assistant conductor to Benjamin Zander with the Philharmonia Orchestra, and assisted Mark Elder with both the LPO and OAE. Since taking second prize in the NAYO Conducting Competition and winning the inaugural Boosey & Hawkes Award at the Edinburgh Festival, Robin is now firmly established as Music Director of five British orchestras, including the highly regarded de Havilland Philharmonic Orchestra – the resident orchestra at the University of Hertfordshire. He has appeared on some of the world’s most famous concert stages, including Snape Maltings, London’s Cadogan Hall, the Rudolfinum in Prague and the Banff Centre in Canada. In 2008, Robin gave a concert at the Olympic Stadium, Nanjing, conducting live on Chinese television before an audience of 70 million. 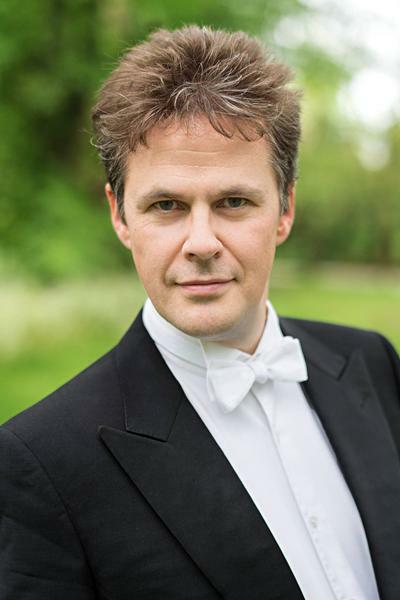 Soloists with whom he has enjoyed successful collaborations include Guy Johnston, Aled Jones, Jack Liebeck, John Lill, Craig Ogden and Raphael Wallfisch. Robin studied at the Accademia Chigiana, Siena, with Myung-Whun Chung and the legendary Ilya Musin. He gained his Bachelor’s degree from King’s College London, and a Masters from UEA in Norwich. He furthered his conducting training in the USA with Joseph Gifford, and in Estonia, attending masterclasses with Neeme and Paavo Järvi at the Oistrakh Festival. Robin also studied with Sir Charles Mackerras, Sian Edwards, Sir Mark Elder and Benjamin Zander, and participated in the first ever Conductor Development Programme with Milton Keynes City Orchestra in 2012. Passionately committed to the training of younger musicians, Robin has guest-conducted orchestras at both Trinity Laban Conservatoire and Guildhall School of Music, and works regularly with young conductors at the University of Southampton. In 2008 he was involved in the Barbican Young Orchestra project, preparing the inaugural orchestra for Sir Colin Davis. Robin is also dedicated to contemporary music and recordings. Since making his first professional studio recording in 2008, he has released three more. All are available from iTunes and Amazon.